On a Sunday walkabout with Thom, we once again found ourselves the only Westerners on a very local street. 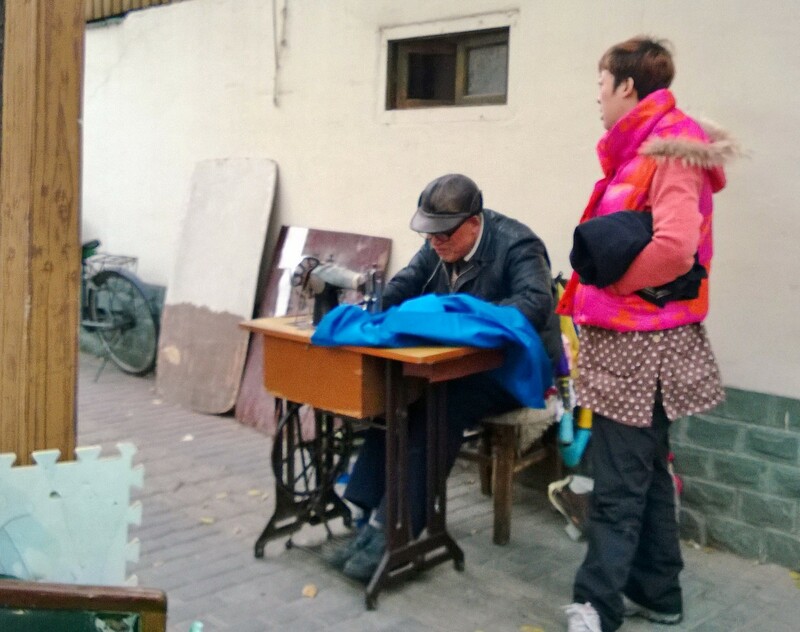 As we wandered around the former French Concession, we observed how the average Shanghai citizen enjoys their Sundays-usually their only day off during the week. The sidewalks are where the people live and get their chores done, whether it is a hair cut or having their pants hemmed. Using a sewing machine that I would consider an antique, it gets the job done for customers needing repairs to their clothes. Carefully trimming one woman’s hair, the sidewalk barber may lack a fancy salon but her customer obviously didn’t care. Most dining is done curbside, usually eating noodles from the vendors who cook on hot plates and open fires and served on folding tables. 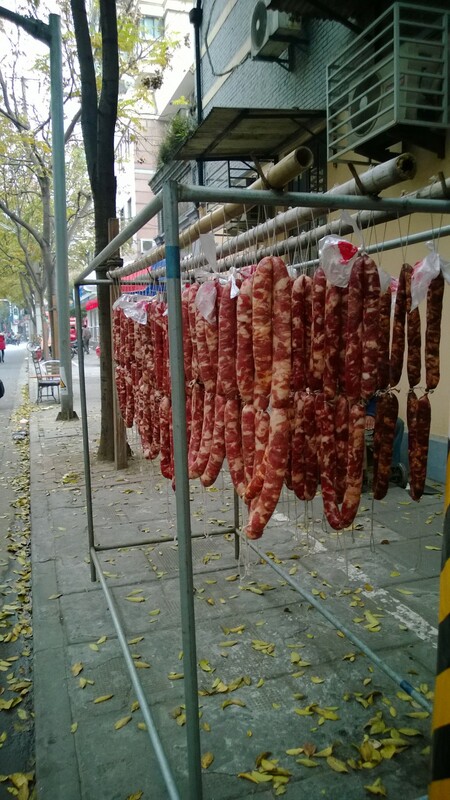 Of course, there is always some interesting “street meat” hanging for those courageous enough to try it. Not me, of course! String of meat anyone-your guess what it is??? 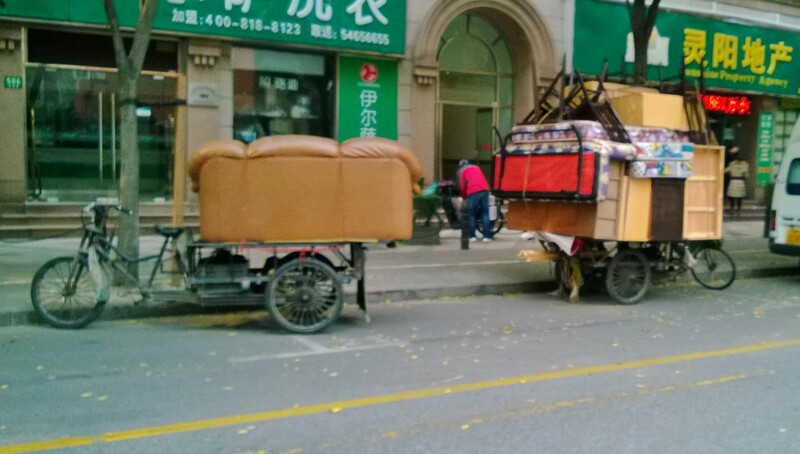 And no need to book a truck to move your very heavy furniture when you have pedal power. It’s amazing what you can fit onto a bicycle and a cart! Moving day-cycle style! It will be interesting to see how life changes on the streets as the weather gets colder. Will the bicycles keep on carrying their heavy loads and moving cargo where it needs to go? 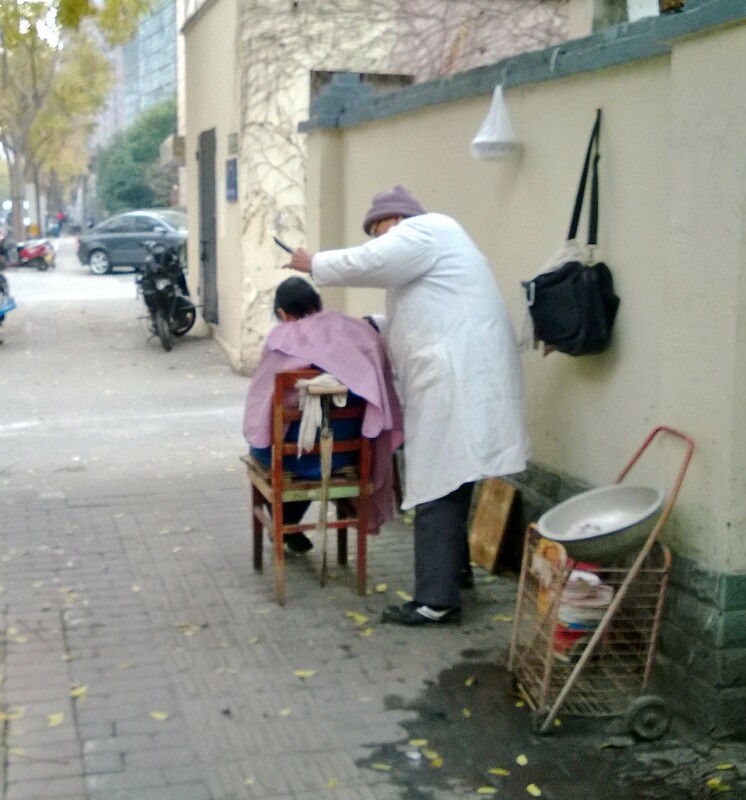 Will the sidewalk barber and seamstress continue to take care of customers as usual in icy conditions? 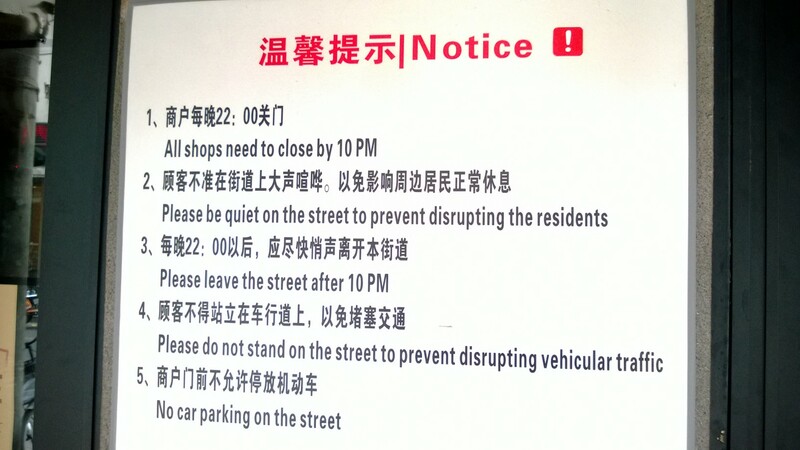 The Chinese are a hardy bunch so I’m imaging that nothing stops them from going about business as usual. One street we walked had very specific rules posted on every bar, primarily it looked like for the ex pats who like to drink and get rowdy apparently. We had heard about this area’s reputation. This street is lined with expat-friendly bars but upstairs the locals live and it was reported that they have come up with creative ways to stop the late night partying–they simply dump their bathwater on the patrons sitting outside to get them to shut up late at night after they have had too many brews. I can only imagine what that scene must have looked like before the bars put up the current awnings to keep their customers dry. We’ll have to come back at 10 p.m. one night to see if they really do close that early. I can’t imagine anyone complies with these rules. That would be very un-Chinese and contrary to doing business but one never knows. If I got someone’s bathwater dumped on me, I might be compelled to comply with just about any rule.